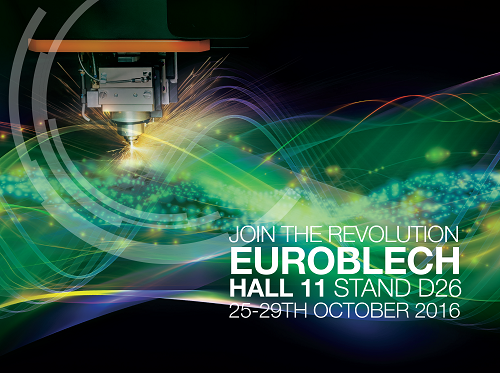 Yamazaki Mazak is planning a revolution at EuroBLECH 2016 with new laser machines and automation systems making their world debuts. Taking pride of place is the new Super Turbo-X 3015 Fiber series, the latest generation of the highly popular Super Turbo-X series of CO2 laser machines, that have sold more than 4,000 units across Europe since 1990. The new fibre machine, which is available in both 2kW and 3kW versions, has been specifically developed for laser users who require optimum productivity allied to reduced running costs, lower maintenance costs and the ability to cut highly reflective materials, such as copper, brass and galvanised sheet. The Super Turbo-X 3015 Fiber series also boasts a best-in-class reduced floorspace of 2,900mm x 7,400mm, which is unmatched by competitor fibre machines, and crucially can be fitted with Mazak’s existing FMS laser automation systems, which enables an easy upgrade to fibre cutting for existing ST-X CO2 laser machine users. Mazak is also introducing two new automation systems at EuroBLECH 2016. An OPTIPLEX NEXUS 3015 4kW laser machine will be equipped with the latest version of Mazak’s flexible automation technology. QUICK Cell, which has been designed by famed Japanese industrial designer Ken Okuyama, is available in three different specifications, 6-stocker, 10-stocker and 14-stocker versions. The new QUICK Cell technology, which is capable of significantly faster processing speeds compared to the original design, enables unmanned laser cutting operations, with the next operating pallet being prepared during processing. The new pallet is loaded as soon as the cutting process is complete with the used pallet moved to the stocker. The version being exhibited at EuroBLECH 2016 is a 6-stocker version. Mazak will also be exhibiting the new LaserFlex 2.0 materials handling solution which is fitted to an OPTIPLEX 3015 Fiber 6kW laser cutting machine. LaserFlex is a compact, easy-to-use laser automation solution that enables the fast handling of raw plates, with a process time for the exchange of raw and cut plates of less than 75 seconds when teamed with the OPTIPLEX machine. The LaserFlex system is easily expandable depending on the storage capacity or the number of laser machines it is required to feed. Mazak will also introducing its new laser CNC, MAZATROL PreviewG, the world’s fastest CNC. PreviewG combines intuitive touchscreen operations, similar to smartphones and tablets, with new machine hardware and servo systems, which together can dramatically reduce programming and processing time. Alongside, Mazak will also exhibit an innovative laser technology, which will be making its world debut at EuroBLECH 2016.